Forrest's Effective Thinking Development is based on over 30 years of research on Effective Intelligence™ (EI™), the work of the Dutch electronics giant Philips and British consultant Jerry Rhodes, that revealed the mechanics of thinking in organizations. EI gives leaders and teams a powerful tool for working with others constructively and developing and communicating ideas effectively. EI also enables you to achieve the best solutions every time by using the right kind of thinking for each task. EI is a simple modular and scalable system that integrates with any existing corporate culture and constructs - in fact, it works with anyone, anywhere, at any time. You can immediately start using this candid, practical approach in your workplace. How does Effective Intelligence make you more effective? Effective Intelligence shows you that all tasks require specific types of thinking, and that you can consciously shift your own type of thinking to match. No other instrument does this. Effective Intelligence shows you the types of thinking to which you and others are biased, allowing you to better understand each other and communicate more effectively. With these skills and knowledge, individuals, teams and organizations work faster and smarter. Why? Because thinking is the first and universal competency. The day-to-day and long-term results of any business are dictated by the quality, speed and flexibility of thought. Improving how you think brings the best return on investment – every activity benefits. 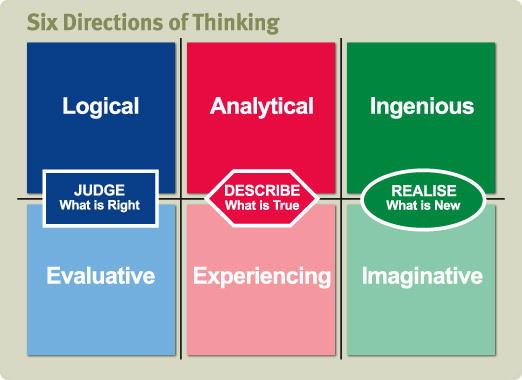 Research into Effective Intelligence discovered that every action is the product of three types of thought: “Judge” (choosing what is “right”), “Describe” (examining what is “true”) and “Realise” (searching for what is “new”), represented in Effective Intelligence by the colours blue, red and green. These three types of thought are divided into two dimensions – Hard and Soft. The Hard dimension tends to be tangible, external and impersonal, while the Soft dimension tends to be intangible, internal and personally focused. The delivery of Effective Intelligence is customized to the thinking needs of your organization. Typical deliveries have included half-day, full-day and multi-day group and/or executive team sessions, and one-on-one 90-minute coaching debriefs of Rhodes' Thinking-Intentions Profiles™ . Fundamentals of Effective Intelligence™ is a one-day workshop that introduces the concepts of Effective Intelligence and applies them to everyday tasks. Enhanced Effecting Intelligence™, a two-day workshop, is ideal for organizations in search of specific performance improvements among team members. Teams or individuals who wish to enhance productivity in the workplace. Leaders and managers at all levels, from the C-suite to the front line looking to improve awareness, communications and effectiveness within their teams.